The Estates at Snowy Point homes for sale are in a small, 10-lot neighborhood of large, custom-built single family homes that border the Skyway Skiway and is located near Four O’clock Run. These homes lie along a quiet street called Beavers, named for the makers of dams on nearby Sawmill Creek. 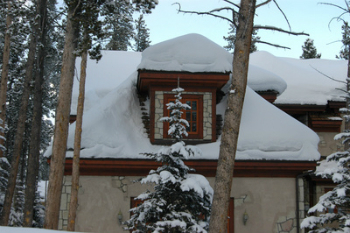 About 60 percent of the Estates at Snowy Point have been constructed, but a few vacant lots remain, along with most of the pine trees that were the sole occupants of this uphill rolling land between downtown Breckenridge and the base of Peak 8 prior to the construction of these estates and their neighbors. Keep reading about the these beautiful homes for sale, or start your home search with the active Estates at Snowy Pointe real estate listings directly below. When the Breckenridge Ski Area began in the nineteen-sixties, everyone skied the last couple of miles from Peak 8 into downtown, usually along Sawmill Creek that flowed gently off Shock Hill. Homes have since filled in the ski-hill side of Breckenridge like an elaborate tapestry, but the main, end-of-the-day route remains. It’s called Four O’clock Run and it weaves between homes and condos, links up with the Snowflake lift and give a lot of folks ski-in and ski-out lodging. At the crest of Shock Hill, Four O’clock follows the creek, but since 2005, skiers can make a northerly turn over to the Skyway Skiway which crosses Ski Hill Road, descends Shock Hill and crosses under Park Avenue to bring skiers to the downtown terminus of the gondola. 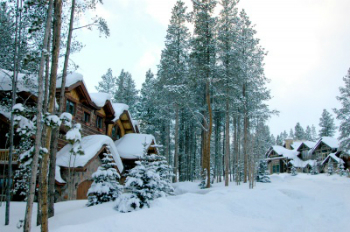 The Estates at Snowy Point are a mountain contemporary style, recently built on pieces of private land that remained after Vail Resort and the town collaborated to build the gondola and skyway. Since the millennium, home design in Breckenridge has leaned toward big logs, recycled wood beams, wide plank flooring and expansive interiors that aren’t predictable from the cozy cabin exteriors. This is what is likely the style of the estates charmingly set on Snowy Point. Size: 3525 sq. ft. to 6519 sq. ft.
From the traffic circle at the north edge of Breckenridge, take Park Avenue around until it nearly joins Main Street at the south side of town, just after the last turn to the right from Park (Village Road), DerSteiermark will be on the left. The is underground parking for guests and residents and a small parking lot to the north and east of the building. An expert from the Breckenridge Associates team is waiting to show you around the Estates at Snowy Point neighborhood. Contact us online to find out more!